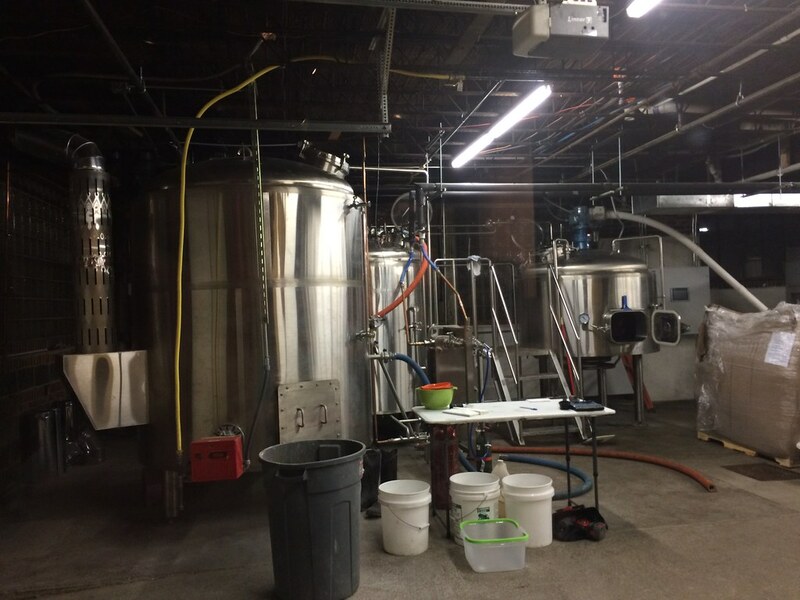 Morgantown's nanobrewery has expanded -- and now includes a full-fledged taproom. 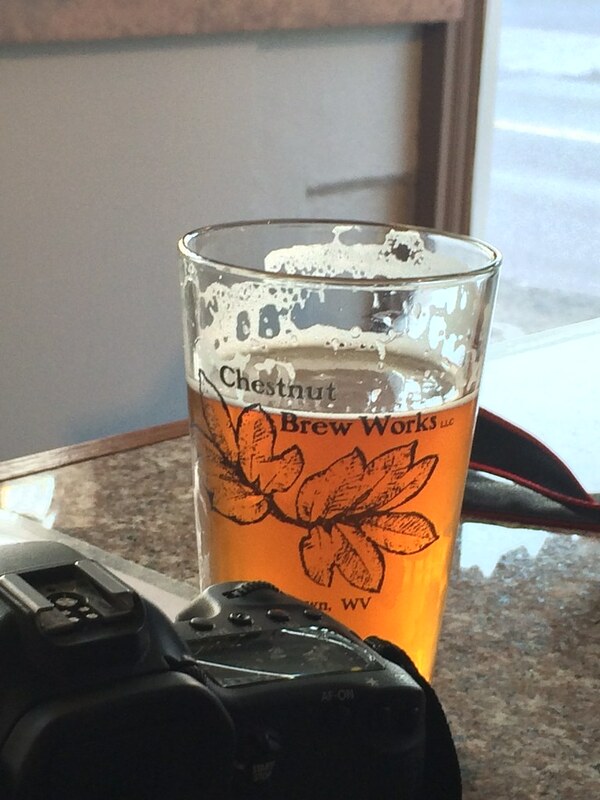 Chestnut Brew Works, home of my favorite beer Nate's Nut Brown Ale, has opened its brewery and taproom in South Park at 444 Brockway Avenue and will have a grand opening Friday at 4 p.m. Owner and head brewer Bill Rittenour graciously allowed me to feature him in a story for a magazine a few months back, and we've had kept in touch. He invited me to a soft opening last weekend before opening up to the public. And, you're in for a treat. This place is great! It's small, but easy to find, being right along the main road. About five parking spaces are located to the left of the building. The front side is glass, so it's nice to have a little view of the busy Morgantown street. There are only a couple high-top tables and the main bar, so if you'd like a seat, get there early. I quickly ordered a flight, which includes Class II Wheatwater, a light-colored and refreshing wheat beer brewed with coriander and orange peel; Halleck Pale Ale, a delectably hoppy beer without the harsh bitterness; Nate's Nut Brown Ale, an English-style brown ale with hints of chocolate and nuts; South Park Porter, a black-colored robust porter with roasted coffee and dark chocolate character; and finally, Your Best Hoption, an IPA with a ton of hops flavor, which accentuate the citrus, piney and fruity characteristics. Start at 12 noon and work your way around so your palate isn't blown out with the hoppiest ones. 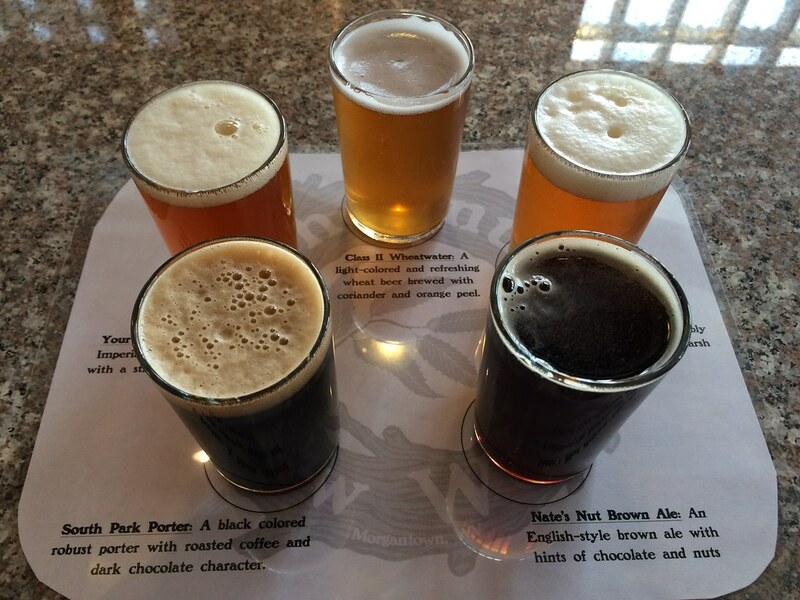 All five samples of the beer for just $7. I honestly love all of these beers. Yes, I'm biased. But Bill is very, very smart. He knows the science behind crafting a perfect beer - and it shows. They all have excellent flavor profiles, even though they're all quite different. I love the Wheatwater for an easy drinkable beer, while I truly enjoy the flavor of the Nate's Nut Brown Ale. 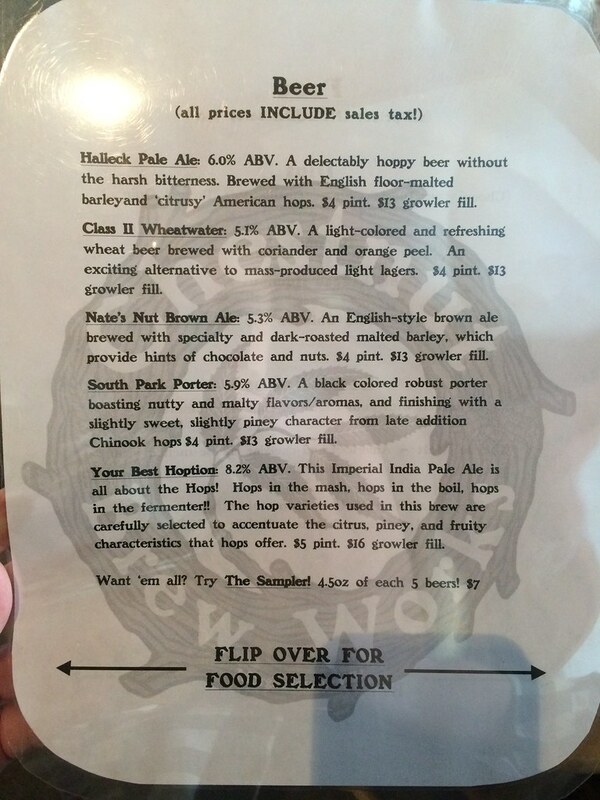 The Halleck gives you that hoppy flavor without being overwhelming. South Park Porter gets a bit more intense with the coffee flavor, and Your Best Hoption is for the serious hopheads. Easily my favorite brewery in the state ... and maybe beyond. 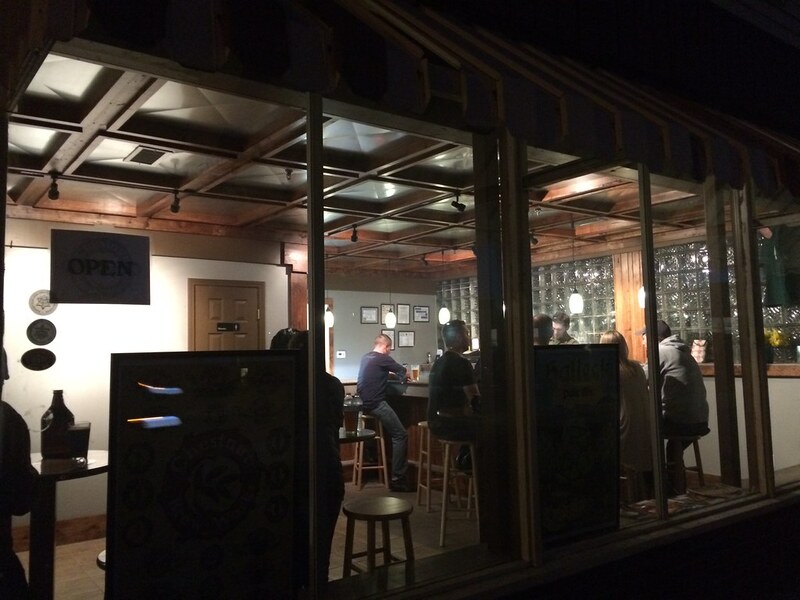 The taproom? It has food! 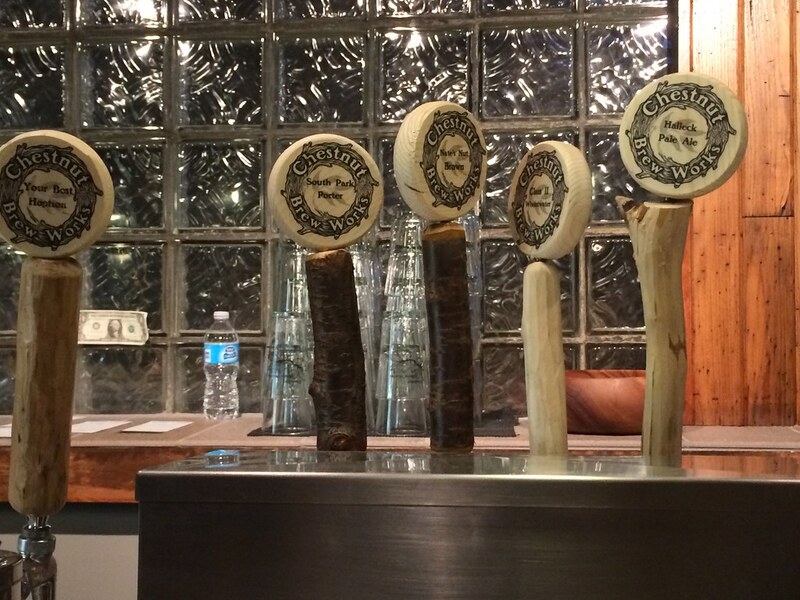 Just a few menu options to help complement the beer. 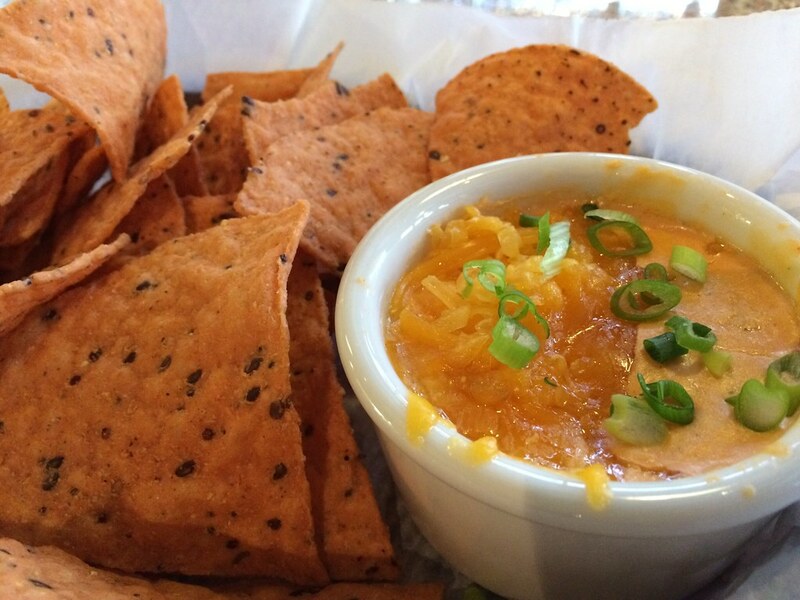 There are the options of dips - hummus, back bean hummus or buffalo chicken dip. And you can choose your chip - tortilla, pita, pretzel or quinoa. Quinoa? Yep, quinoa chips. They're actually really quite good. I'm a fan. 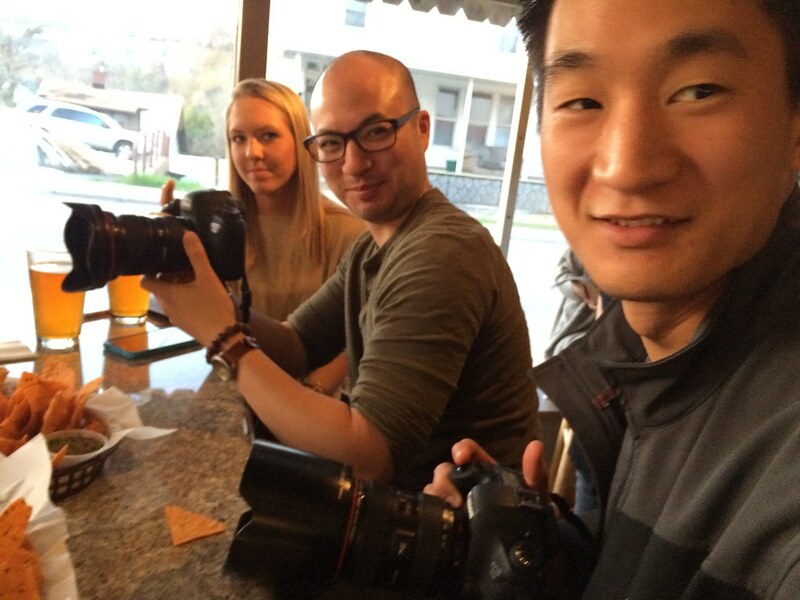 We ordered the buffalo chicken dip with quinoa chips. Delicious! The chips are good and less greasy than most. The dip was cheesy and rich. Seriously so good. 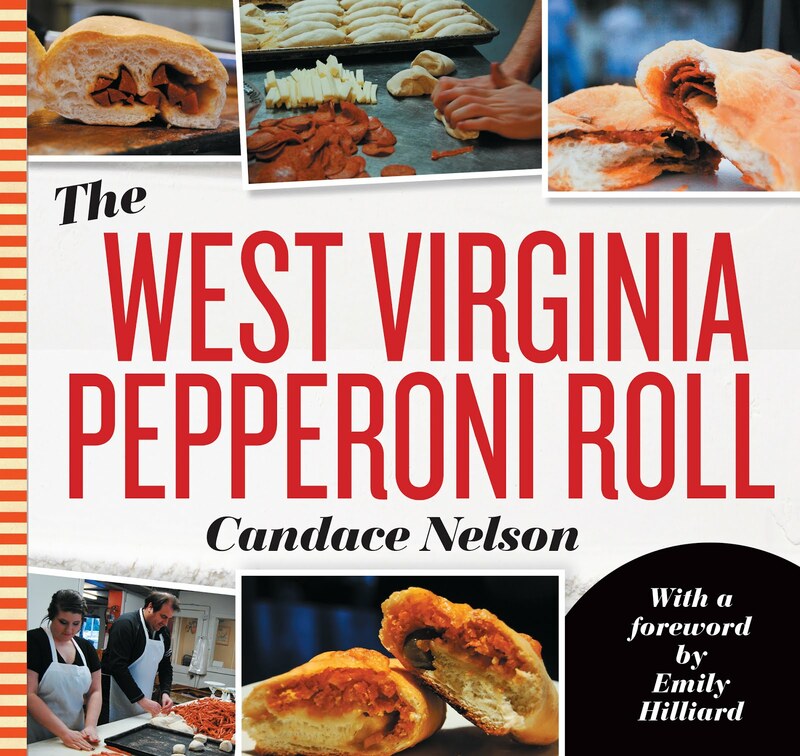 There are also two options for paninis: a cheese melt and a pepperoni roll melt. 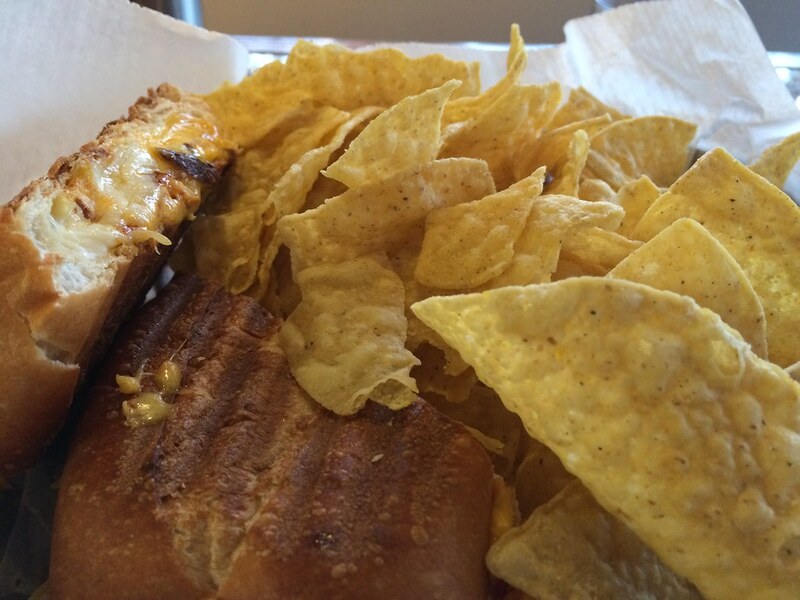 The cheese melt has American and cheddar cheeses, while the pepperoni roll melt has mozzarella, provolone and American cheeses and pepperoni, of course. Each are $6. I ordered a pepperoni roll melt (which comes with a side of humus). I went with the black bean hummus and tortilla chips. 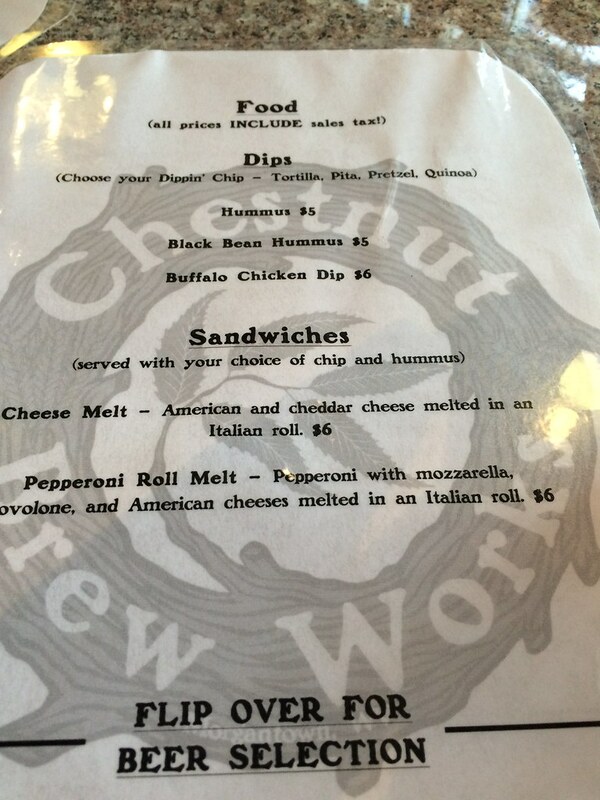 I love the taproom take on a regional food - the pepperoni roll. It's definitely more indulgent with a nice layer of melted cheese, but it's a nice version of that food we all love so much. Oh, and I can't forget the best part: growlers. 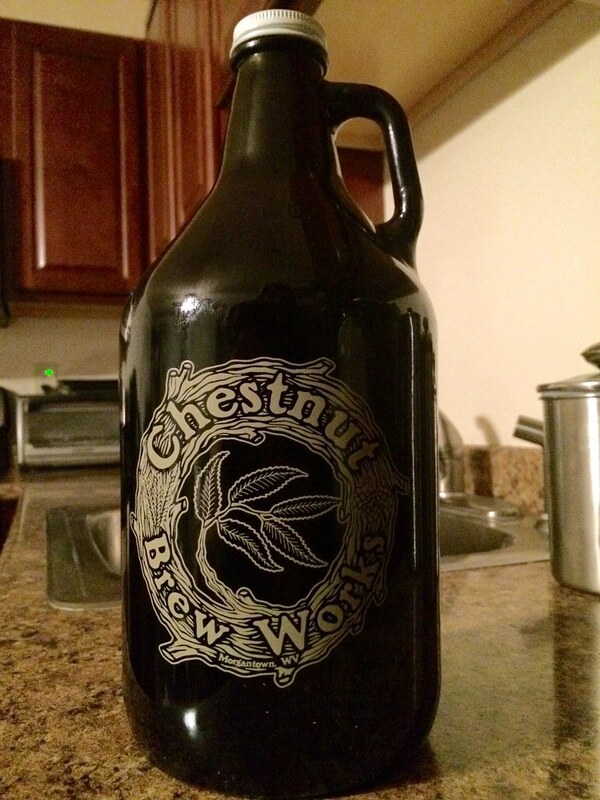 I can now take a growler - branded with Chestnut Brew Works - home filled with my favorite beer. There's also some merchandise like shirts and pint glasses available. I left with a full belly from tasty food and a flight of beer plus a full growler for just about $26. That's a pretty damn good deal.